One of my favourite blogs, History Spork, is back with a take on The Other Boleyn Girl, a movie based on Philippa Gregory's novel of the same title. Since Tudor specialists don't think very highly of her research, and the movie seems to be rather close to the book, some of my readers should get a laugh out of it. You may also check the archives of History Spork; they've taken their sharp pens ... er, keyboards to a bunch of other questionable 'historical' movies. But get some popcorn and a glass of wine, because you can easily spend a few hours there. The weather is fine these days albeit a bit on the hot side (at least for me who thinks anything above 25°C is what hell must be like). So my father and I decided to take a little tour down to the Weser, one of our favourite areas. We found a few things on the way. This pretty building is the Welfenschloss in Hannoversch-Münden, built by Duke Erich II of Calenberg-Göttingen in 1560 in the style of the so called Weser Renaissance. It was a residental palace used for living, but also provided rooms for the administration of the area. In later generations its importance as ducal seat decreased, and in 1849 the south wing burned down. Today it houses the town library, a museum, and the tax office. The town hall itself dates back to the Gothic style, but in 1618 a Renaissance facade had been added with a number of decorative elements, among them as set of chimes that show figures from the life of the (in)famous Doctor Eisenbarth. Hannoversch-Münden has about 700 of them and all in a fine condition. The town with the odd name it got to distinguish Münden from Minden (which is not far away) lies at the confluence of Werra and Fulda, and because of this favourable situation was an important trade centre in the Middle Ages. Remains of the Medieaval fortifications and the old harbour, the Schlagd, can still be seen. There is an exhibition of the Hedemünden finds in the Welfenschloss. I had seen some of them a few years ago, but this exhibition has added the new finds and a model of the supply fort and the marching camp at Hedemünden. A well made display, though the glass makes it a bit difficult to get good shots due to all those reflections. The remains of the Bramburg are hidden in a beech wood on a promontory above the Weser. It was first mentionend 1093 but must have been older. Heinrich the Fat, the founder of Bursfelde Abbey, had the castle fortified in order to protect the nearby abbey. Later it came as fief to a family von Stockhausen that proved prone to highway and high river robbery. Thus the Bramburg was besieged by Landgrave Wilhelm of Thuringia and partly destroyed. Today only the keep remains, and it's really well hidden in all that lush green. I think you'l understand why we love the Weser surroundings so much. On the way back we had dinner at one of our favourite restaurants, the one in Bursfelde. It has a terrace facing the Weser; the most beautiful place so sit on a peaceful summer evening. I managed to take some photos from the bus though it was tricky. The best chances were when the bus had to stop to let a car pass on the single track road. The bus tour takes about an hour and goes through some of the most scenic parts of Mull. In the morning, the weather was pretty bad - typical Scottish, people say, though my experiences included a lot of sunshine both times I went to Scotland. There are eagles in Glen More, but they must have kept elevenses; we didn't see any. That's a Swiss bus in front of us. On the way back the sun had come out (it had be shining all afternoon on Iona) and I kept my camera ready to get some shots of the beautiful Mull scenery in the evening sun. I was rewarded. The way along Loch Scridain was especially picturesque, and I had picked the right (in fact, left, lol) side to sit. It was the wrong side for watching the deer, though, but since we have our share of deer in Germany, I didn't mind. The tricky thing about taking photos from a bus is not only the motion but also the reflections in the windows. But as you see, I got a few pictures where those reflections aren't too bad. Dunstaffnage Castle stands on a rock promontory where Loch Etive meets the Firth of Lorn, thus guarding the entrance into central Scotland via Loch Etive and the Pass of Brander. The promontory also shelters Dunstaffnage Bay from the westerly winds and provides a good harbour. 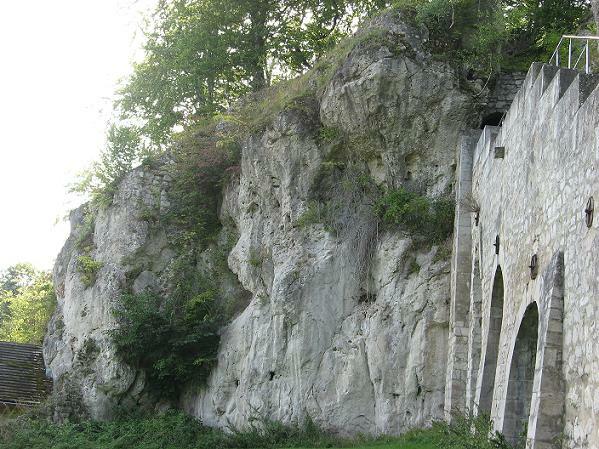 The rock foundation and castle walls rise to 15 metres and more, with the entrance several metres above ground. In former times, the way between the outer staircase and the gates was additionally protected by a drawbridge. Definitely not an easy place to get into back in the Middle Ages. Today you only need to pay your fee in the house outside the castle, ascend the stairs and cross a solid wooden bridge, without danger of someone shooting arrows at you from the - now completely ruined - corner tower. Dunstaffnage, bearing a name part Gaelic (dun = fort) part Norse (stafr-nes = staff promontory), is one of the candidates for the Dalriatan seat of Dun Monaidh, albeit no archaeological proof has been found so far. In 840, Cináed mac Alpín 'united' (I doubt the Picts saw it that way) the Dalriatans and Picts and moved the centre of power to central Scotland, leaving a vacuum at the west coast into which the Vikings stepped. Their rule over the west coast was officially acknowledged in the treaty between King Edgar of Scotland and King Magnus 'Barelegs' of Norway in 1098. Dougall's son Duncan built Dunstaffnage Castle around 1220, and probably Dunollie Castle as well. He sided with King Hakon of Norway against King Alexander II of the Scots in 1230, conquering Rothesay Castle from Walter Stewart, but in 1237 seemed to have made his peace with Alexander. He was the only noble from the west coast to sign a document sent by King Alexander to the pope - he signed it as de Ergadia (from Argyll). Besides the castles at the coast he also founded Ardchattan Priory in 1240. His son Ewan who succeeded Duncan in 1248 was in a nice pickle since he held his island possessions under Hakon of Norway after a visit to Bergen during which he also got granted the title King of the Isles, and the mainland territories as vassal of King Alexander II. After Ewan was also appointed to step in for the deceased king of Man, Alexander had enough of the Norse power concentration on the isles and sailed west with an army, landing on Kerrera. He demanded that Ewan surrender several castles to him, among them most probably Dunstaffnage which Ewan had further fortified (he added the west tower). But Ewan told him he'd already done hommage for the those lands to Hakon. "No man can serve two masters," said King Alexander. "One can quite well serve two masters provided the masters are not enemies," was Ewan's reply. It's probably well for him that King Alexander II died of an illness soon thereafter (July 8, 1249) or he would have been in trouble. For several years, the stalemate continued until Alexander III reached majority, told his advisors to go fishing and began his reign. His activities on the west coast soon forced Hakon to bring in a large fleet. He too, landed on Kerrera and detained Ewan as 'guest' in hope to pressure him for support. But Ewan must have had a stubborn streak because he refused Hakon's demand as well. King Hakon then lost the battle of Largs in 1263 and part of his fleet in the autumn gales, and withdrew to the Orkneys where he died the same year. Negotiations between King Alexander III and Hakon's successor King Magnus took another two years. During that time Ewan proved sly as well because he seemed to have simply outwaited the results before deciding for one side. The ensuing Treaty of Perth in 1266 transferred the Hebridean islands from Norway to Scotland. Ewan had his possessions restored (if he ever lost any of them in the first place; the sources are none too clear) though the title King of the Isles went to the MacDonald branch of Somhairle's descendants. Ewan clearly sided with the King of the Scots now, marrying his children into major Scottish families. His son Alexander Lord of Lorn would become one of the chief powers in the west. Ewan mac Dougall died in 1266. Information: Historic Scotland guidebook to Dunstaffnage Castle and the website of Clan MacDougall. Continued with the Wars of Independence and The Campbells. This one can probably called a pic spam post, lol. Just some photos I took on the train from Glasgow to Oban. I'm very busy writing right now and too lazy to do a long post. The West Highland railway line is considered one of the most scenic in the world. It goes from Glasgow to Fort William and Mallaig, with a side line branching off to Oban at Crianlarich. Ten years ago I took the route all the way to Fort William and a few days later to Mallaig to cross over to Skye. This time I rode the train to Oban, and kept holding the camera out of the doors at interesting stops on the way. The mix of sun and clouds made for an interesting light in some photos. But the day was rather warm and nice overall. The train stopped in Crianlarich for a few minutes and I could step out on the platform and take photographs of the surroundings. Crianlarich is truly in the Highlands, surrounded by high mountains. But the official beginning of the West Higland Line after it leaves Glasgow's suburbs is 'Arrochar and Tarbet' at the entrance to the famous Loch Lomond. It was very difficult to get good photos out of the moving train, but I was lucky that a few turned out to be not too blurred. The train runs along most of Loch Awe, opening one spectacular view after the other before it passes along the Falls of Cruachan into Oban.